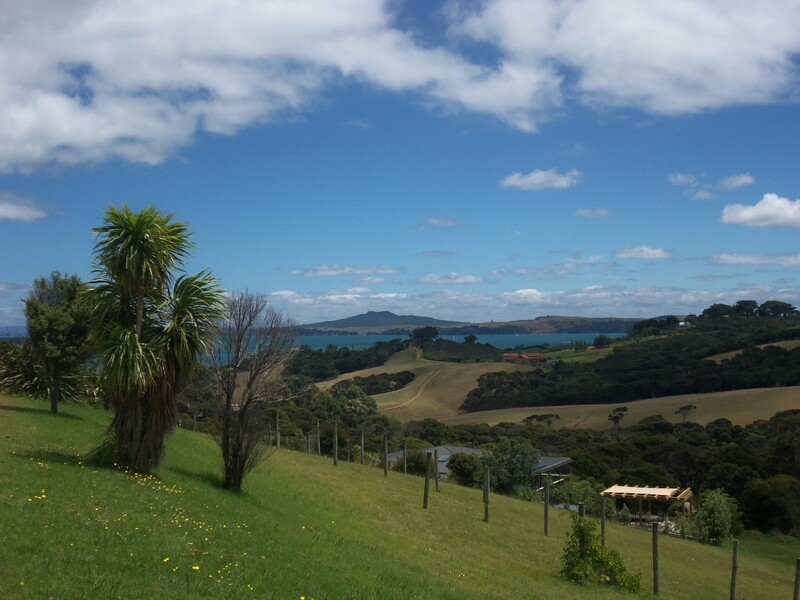 High on our list of things to do before we leave Auckland was to return to Waiheke island for some winetasting. On our first trip to the island we enjoyed archery, clay bird shooting and cider, but somehow missed the wine! At the weekend we took the ferry back and had chosen vineyards in walking distance of Matiatia harbour. Our first stop was Cable Bay for lunch with a view. After some tapas style dishes and a glass of their Pinot Gris we descended to the cellar door for a $10 tasting of three whites, a rose and a red. We asked the staff about the difference between Pinot Gris & Pinot Grigio… turns out there is very little. Feeling a little tipsy we blew our weekly budget on bottle of their finest P-Gris and one of their reds. Oops. 5 minutes up the road is Jurassic Ridge (great name for a winery! ), which had also been recommended to us. It provides a notable contrast to the bigger vineyards as it seemed to be a one-man show. We had a short sit in the sun and look around while we overheard him lecturing a group of Americans. 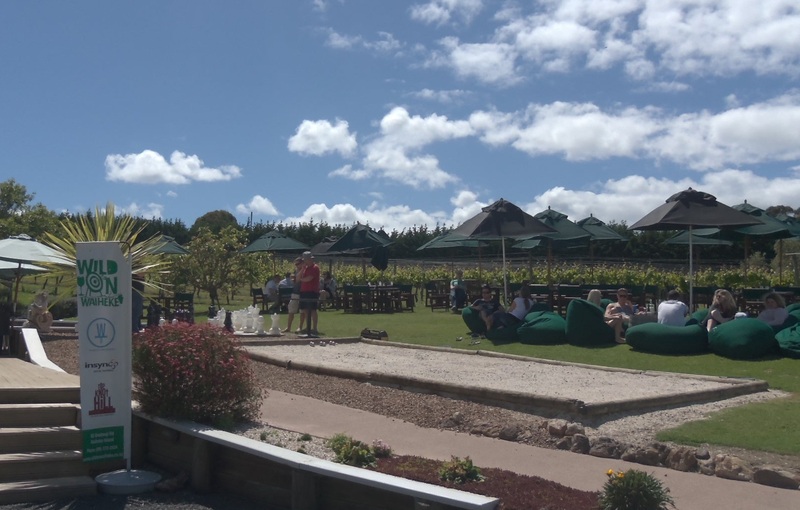 After 10 mins we got tired of not being acknowledged and headed next door to Mudbrick for a glass of their bubbles and more glorious views. Both vineyards are pretty decadent and offer a relaxing slice of island luxury. There’s no need to book ahead, although when we visited they were both closing early for weddings. For getting further around Waiheke you can hire bikes/scooters and their are various vineyard hopper buses. Australia day hasn’t been the only celebration down under this weekend! 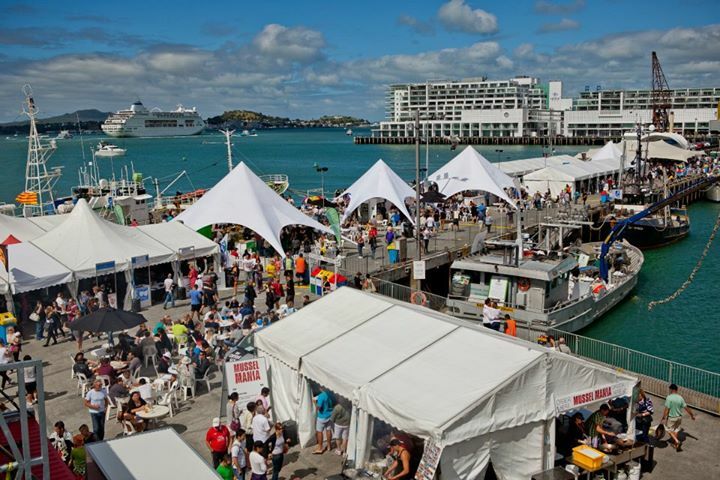 We’ve been enjoying a bank holiday to mark the founding of Auckland city and the waterfront where we live has been a hive of activity. As the more practical half of our travelling pair, I’ll hand over to Rob for our experience of setting up in Auckland and some (hopefully handy) hints. We’ve been in New Zealand for about 2 months now and have managed to get ourselves set up with bank accounts, jobs, phones etc. This didn’t always feel easy or quick, so here are some things we ran into that caused delays and problems; hopefully this will help you sidestep these issues and get to the having fun bit quicker. When you complete your landing card on arrival, really concentrate. You’ve probably been on a long flight (ours was 11 hours) and you’re tired, but if you complete the card incorrectly you’ll be further delayed. New Zealand is very careful about disease, animals and plants being brought into the country so the form asks about items in your luggage. We fell foul of this when I ticked the wrong box to the question about footwear and apparently there was a risk that the British soil attached to my boots could have introduced Foot & Mouth to New Zealand. The customs officers take this very seriously. Without proof of address, you can’t open a bank account. This can be tricky when you first arrive. We managed to get a phone company to send us a letter that worked for opening a bank account. The bank can then provide you with a proof of address (in store) which can be used for everything else. Once you have proof of address, opening a bank account is pretty easy except for a couple of things. Firstly, some banks don’t open on Saturdays which caught us out especially when I began to work Monday to Friday. It seems that in Auckland, the banks in the city centre close on Saturday whilst the banks in shopping centres/malls are open. Just check the opening times before you go and you’ll be fine. Also you have to go into the bank to set up a PIN on your cards. Another thing to bear in mind is that EFTPOS cards let you take money out of ATMs and pay by swiping in shops. If you want to buy anything online, use contactless payments or pay by chip and PIN you need a Visa Debit card (referred to as credit cards) which banks charge you a small amount for. An IRD number is the equivalent of an NI number in the UK, you need one to be paid for work and pay the right amount of tax. Apply for one with an IR595 form you can get from the Post Shop, if you return your documents here they will check you’ve done everything right and send it off for you. The IRD number took about 2 weeks to arrive after the application so if you’re planning on working when you arrive in New Zealand then I’d recommend applying as soon as you can. You don’t need proof of address to apply, a passport and UK driving license worked for us. Recruitment companies seem very similar to the UK and we both found temp office work within a few weeks of arriving (through Madison and Hays). You’ll need your bank details and IRD number to get paid but we had no trouble in supplying this information after our initial meetings. It was helpful to make contact with recruitment consultants before we arrived and have meetings set up for when we got here. Kiwis are quite a lot more relaxed at work than I was used to from working in the UK. Friday afternoon drinks in the office seem very common and more casual dress seems the norm. This has been our experience so far in the companies we’ve worked for in Auckland, but other companies and work places may well be different. We were lucky to be able to stay with friends for a couple of weeks when we arrived. This gave us time to find out feet get a sense of the city. You could equally do this in a hostel and would also be great for meeting people. We looked for house shares on Trade Me and Gum Tree (where we posted a free ad) and found plenty of properties but that many adverts stated ‘no couples’. We found the apartment we’re staying in through our friend tweeting and subsequently being put in touch with the family we’re staying with. 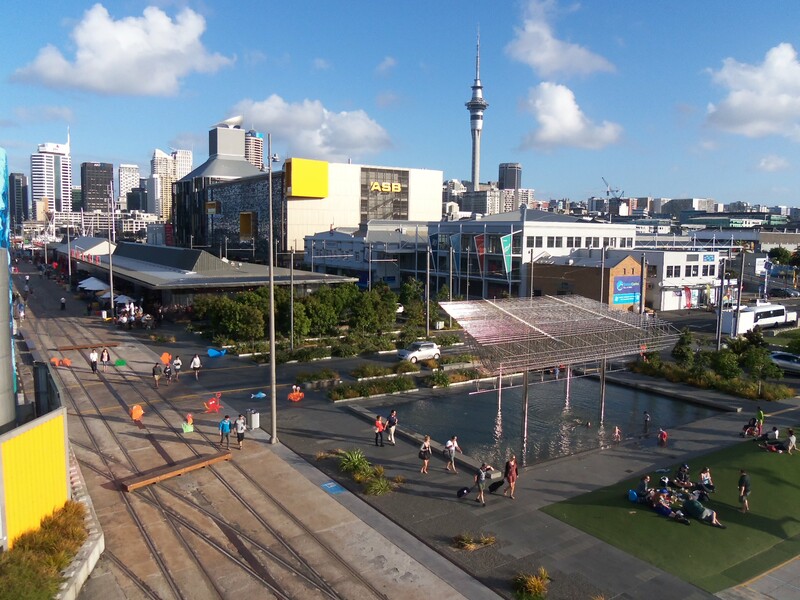 We moved to central Auckland and found food and drink quite expensive to begin with. Not much you can do about it except shop around, you do seem to get paid more than at home (for comparable work) and I hear that it’s cheaper in other parts of the country. There are companies, such as Bunac and STA Travel, who offer packages to support you during these first few weeks – including proof of address and job search. I think I would have felt happier doing this if I was younger or traveling alone. It comes down to personal preference to whether you feel that it is worth the money, but definitely worth considering. Have you had a similar experience when setting up in a new city? Anything you’d add? 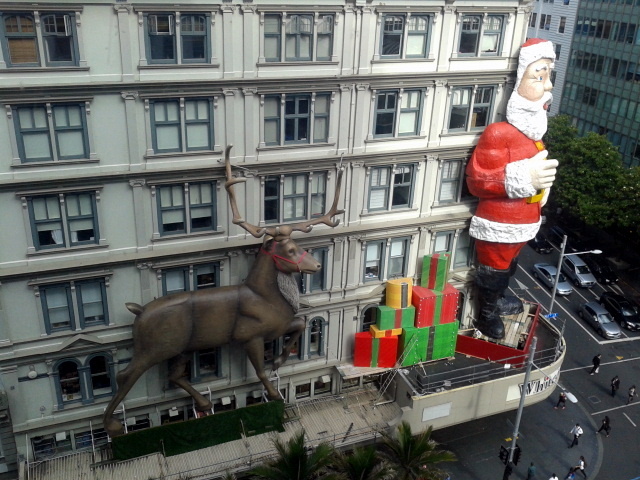 One of the things we wondered before coming to NZ was how the Kiwis do Christmas. Celebrating at the start of summer, do they have the same traditions and use the same imagery as the UK? In short, yes. Yes, they do. 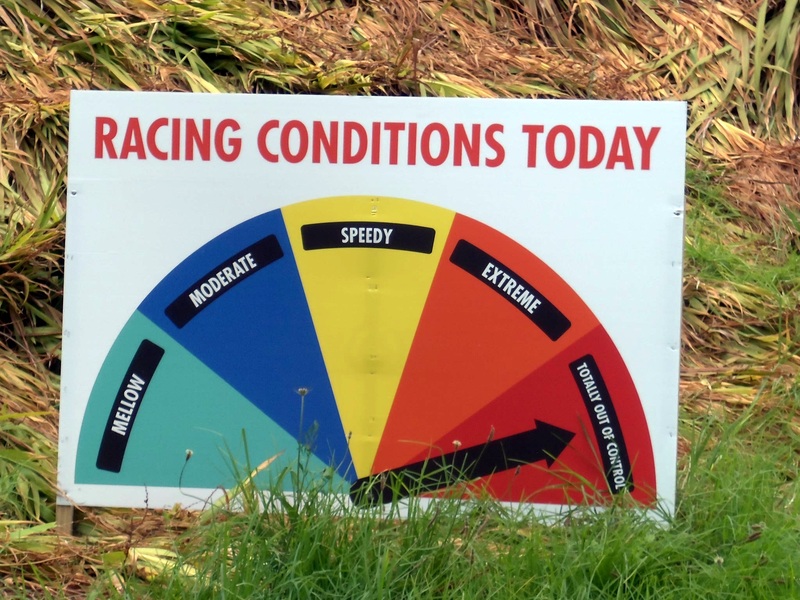 Things are very familiar as we enter the festive season, with the weather prompting the only noticeable differences. But outside, on a balmy evening. We watched It’s a Wonderful Life on the big screen at Silo Park on the waterfront. If you haven’t seen it, make this year the year you do! With fresh popcorn, red wine and a cracking line-up of festive films, we’ll struggle to find an better Friday night alternative. 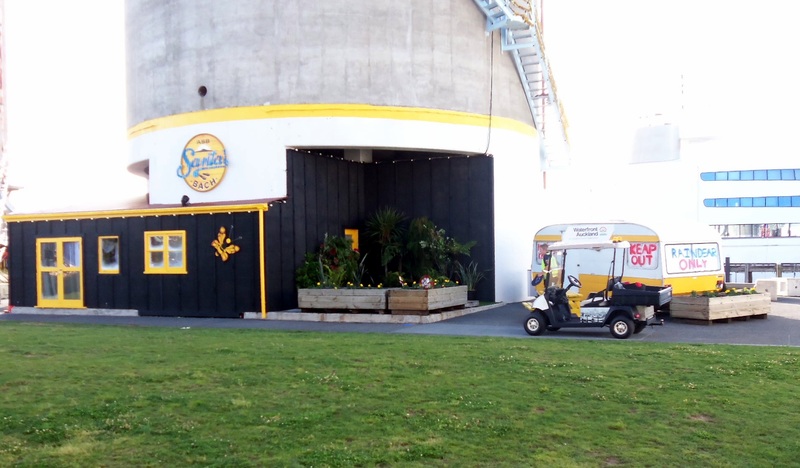 Silo Park is also home to Santa, but not in his grotto – in his bach (summer-house in a silo). I only started at work 2 weeks ago, so I really hope the woman I’m buying for likes Lush! ‘Q. Why does the golfer have 2 pairs of trousers?’ – answers below please. There are an array of Christmas markets for us still to visit. Next weekend we have our Christmas show – Chicago (Auckland Theatre Company’s rather than Leicester Curve’s at home) to come. I’m sure everyone who experiences Christmas in Australasia (not matter how long they’ve lived here) finds the sunshine pretty jarring alongside carols, fir trees and santa in his big red suit. And obviously planning for Christmas already doesn’t feel the same knowing that we’ll be away from friends and family… but we’re hoping good food, wine and some Skyping will make us feel festive. Apologies for the clumsy title of this post, originally I’d thought ‘feeling festive down under’ but it just didn’t work… for multiple reasons. 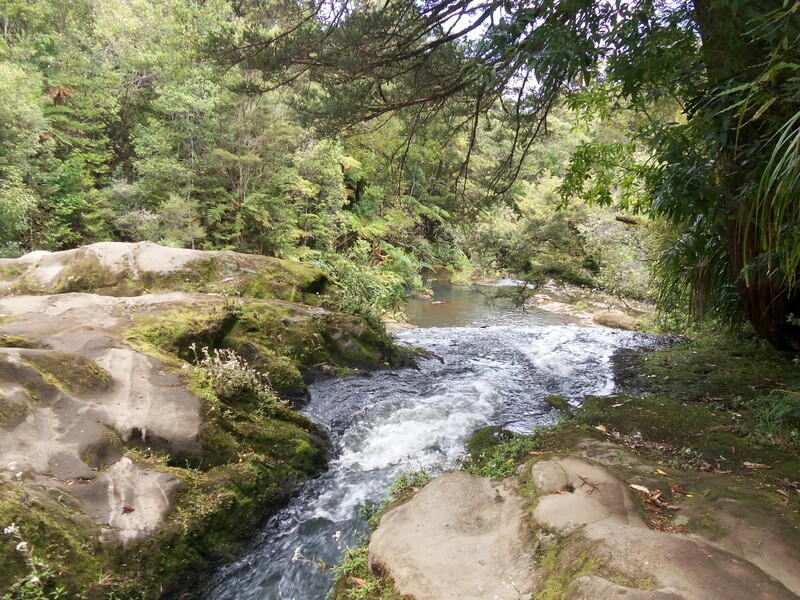 We took a trip to West Auckland last weekend and camped out in the Waitakere Ranges. 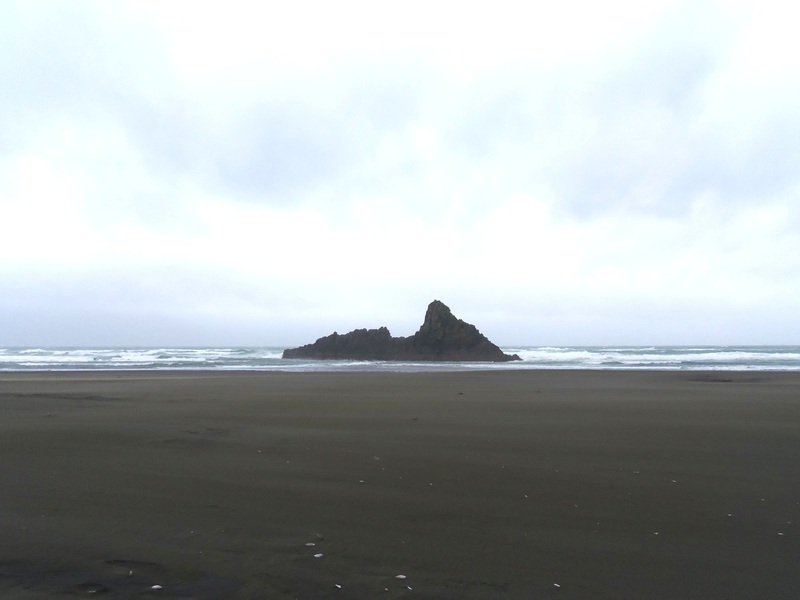 We pulled on our walking boots and headed out into the wild landscape of beach and bush. The forest felt to us like a mix of tropical plants and greenery, like bracken, that you’d see in England. We camped in a small, secluded spot and were the only ones on site. We would have preferred a couple more tents in the campground for our first NZ camp but, after a few beers and lamb burgers, we had a peaceful night despite the rain. Not even a growling possum to disturb us. The many (many) steps were worth it for the views and falls. 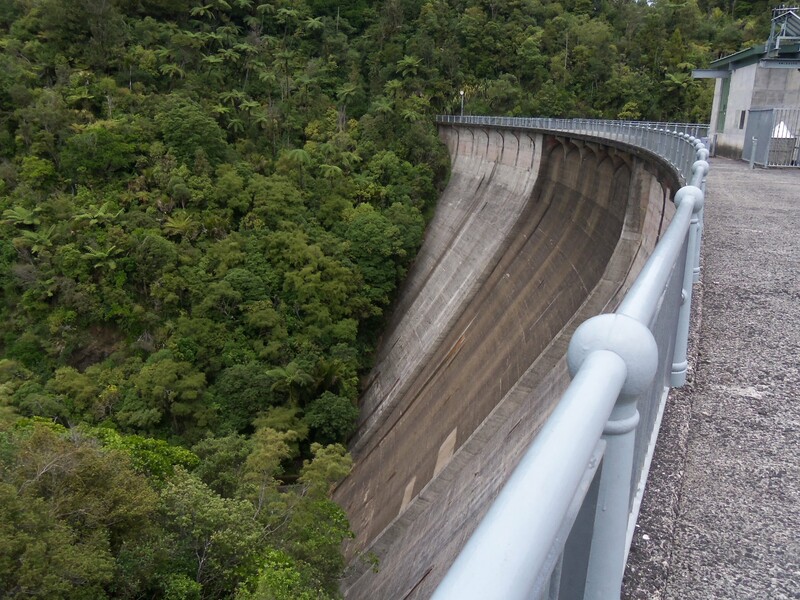 A short walk to a vast dam that provides millions of litres of water a day to the city of Auckland. It was built between 1915-23 – such an impressive human construction. When we visited there was a clean up taking place – Jack Johnson was helping out but we failed to spot him. The weekend outdoors was worth it and hopefully we’ll have time to return to see more. 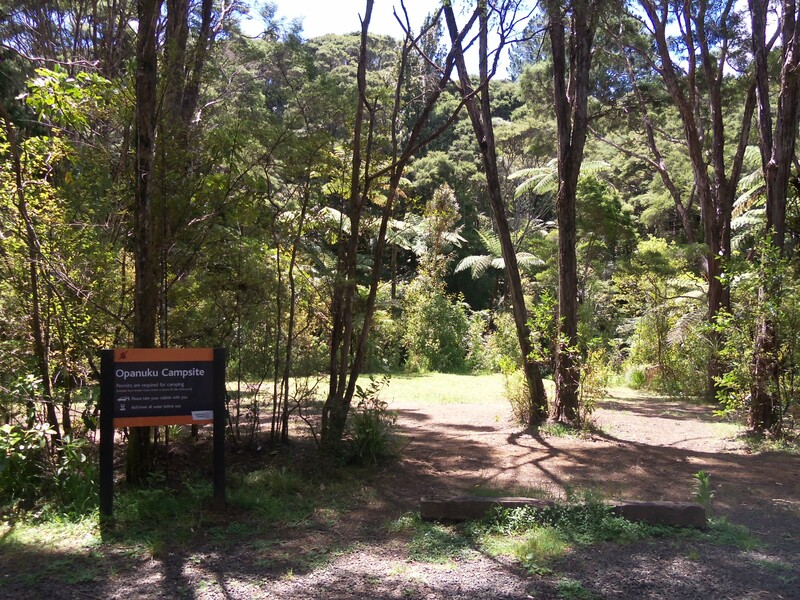 The Arataki Visitor Centre gave us advice on walks and has some breathtaking views. 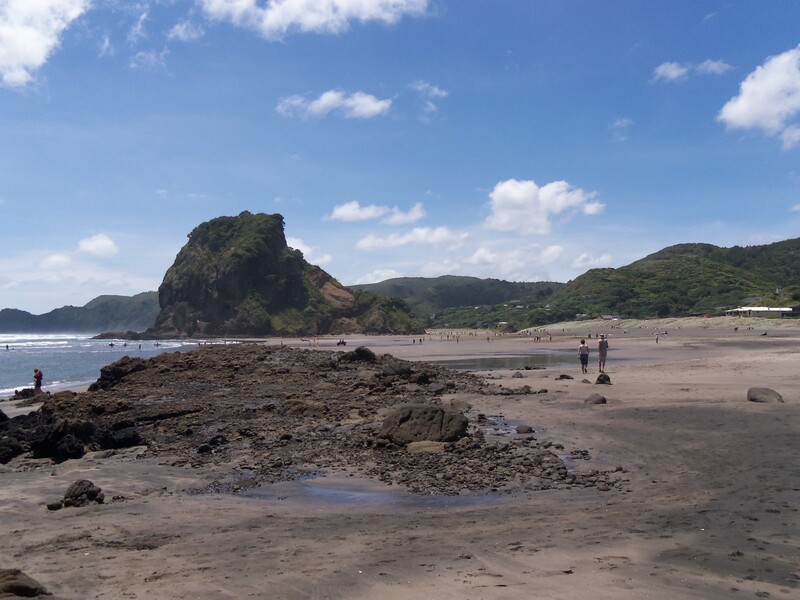 A good place to start a visit to the Waitakere Ranges. Rob and I are not what you’d call ‘sporty types’, but last weekend included cycling, rugby and a trolley grand prix. 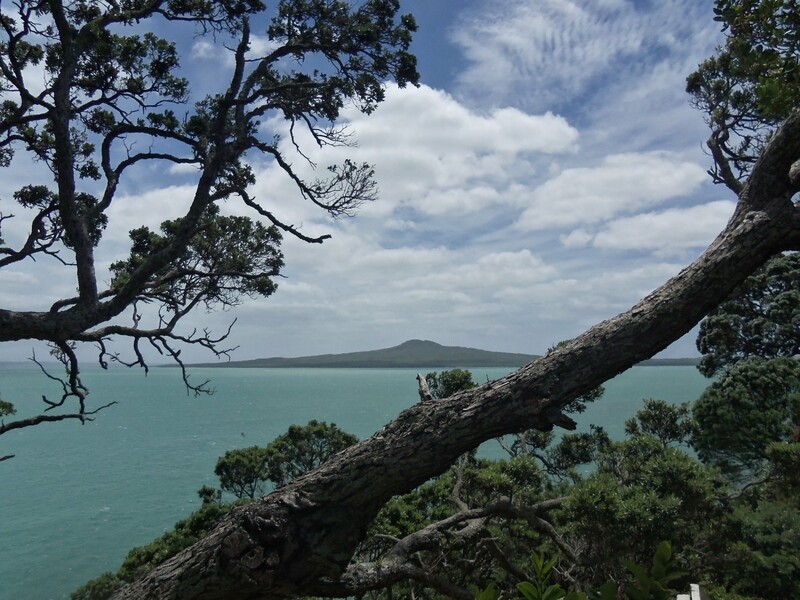 On Saturday we hired bikes for the day and cycled east along the Auckland coast towards the bay of St. Heliers. This came about after I was asked about our hobbies and, not wanting to sound like the inactive culture seekers that we are, said we are keen cyclists (read: own bikes at home). We followed through with the idea and it turned out to be a great way to see a bit further out of the city. 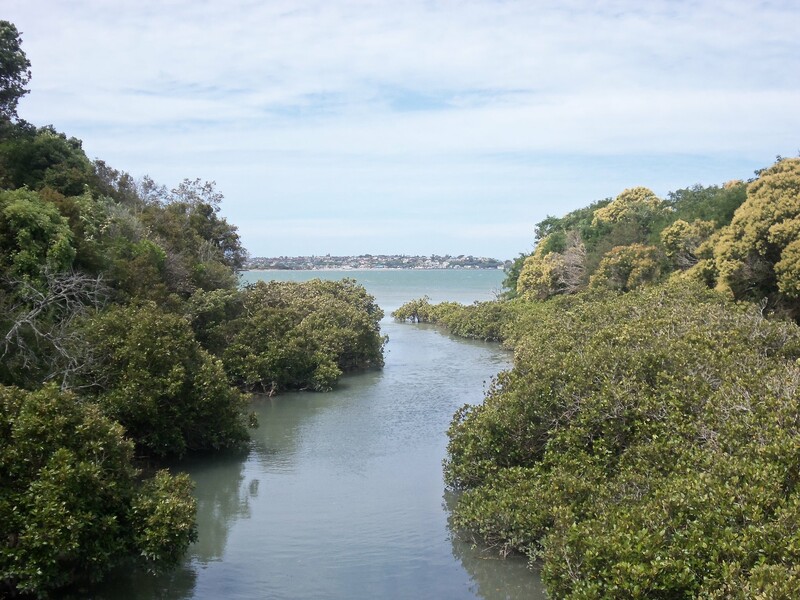 We made a stop at Mission Bay and arrived in St. Heliers for lunch (would recommend Annabelle’s). St Heliers is a quaint suburb with a medium-sized beach, which was pretty quiet for a sunny Saturday. We arrived back into central Auckland with plenty of time and decided to rely on my phone navigation to direct us to Mt. Eden. This led us up steep, residential hills in the afternoon heat when I was starting to tire of the rock-solid saddle of the mountain bike. 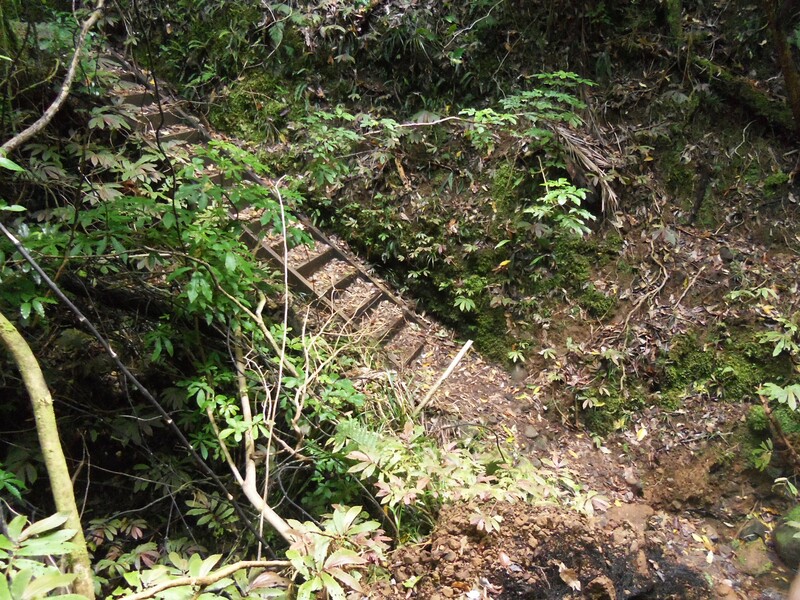 Faced with (what may well have been the last) giant incline to Mt. Eden, we gave up and lay down on Auckland Domain. On Sunday morning we experienced our first All Blacks match, watching them play France on their ‘European Tour’ (which seemed to also include Japan?) We gathered around the TV with the Kiwi family we’re staying with and their friends. I have a basic grip of the rules – that they pass backwards, regularly scrum for the ball and how they score – but not much beyond that, which seems to be an extensive list of infringements. I’d like to say that I learnt lots by watching, but I’m not sure I did, beyond being reminded how aggressive it seems to be and how little the game is actually in play. Nevertheless, it was enjoyable and the All Blacks won. Next week they play England, so we’re planning to make ourselves scarce. 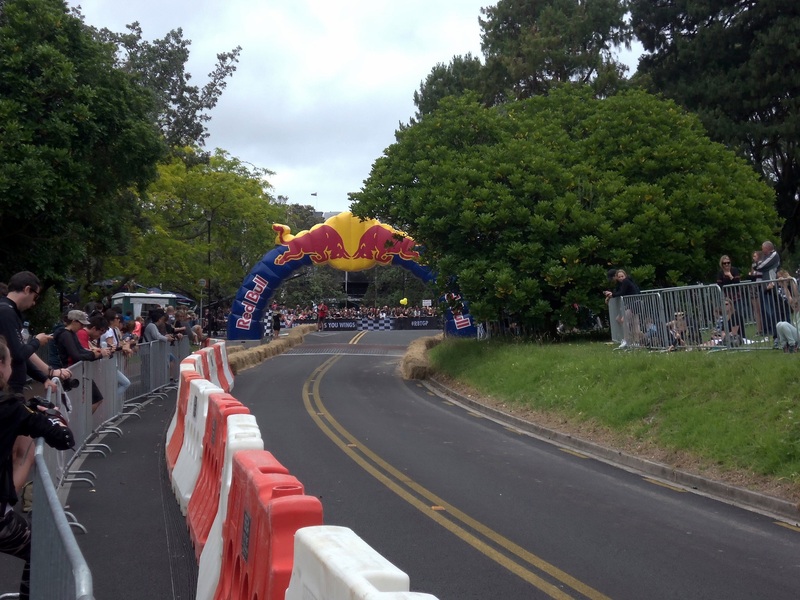 After the rugby we headed back to Auckland Domain for the Red Bull Trolley Dash Grand Prix 2013. 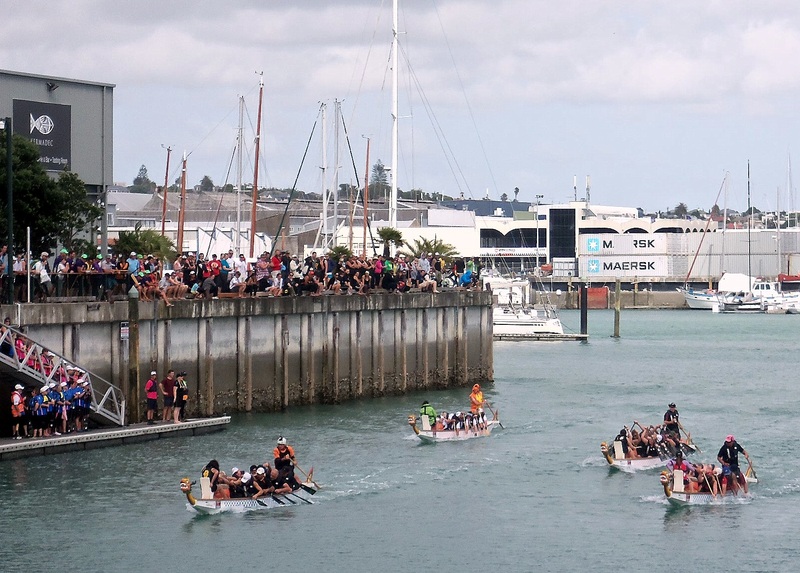 This was a free, family event with 40 teams from across NZ entering their lovingly hand-made and creatively themed trolley racers to make the downhill run of the track. Hosted by Jono and Ben (NZ’s answer to Ant and Dec) and complete with celebrity judges, we were struck by the scale of the event. We watched most of the entries on a large screen in a festival feel set-up. The teams’ themes extended well beyond their trolley-design and we were treated to short pre-race performances from storm troopers, Despicable Me minions and smurfs. Provocative entries came in the form of team ‘North Korea’ and the second-place team ‘Cook Me Some Eggs’ (a line from NZ film Once Were Warriors). Team Zoom Car Wash took first place after storming the track in 45 secs. 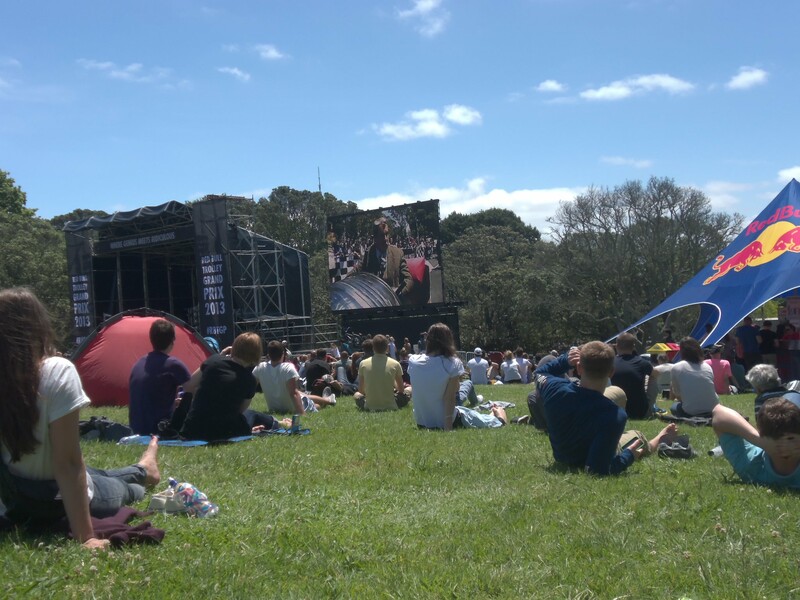 Following the competition we stayed sitting in the sun for the eclectic sounds of Wellington band Fat Freddy’s Drop. which rounded off the afternoon pretty nicely. 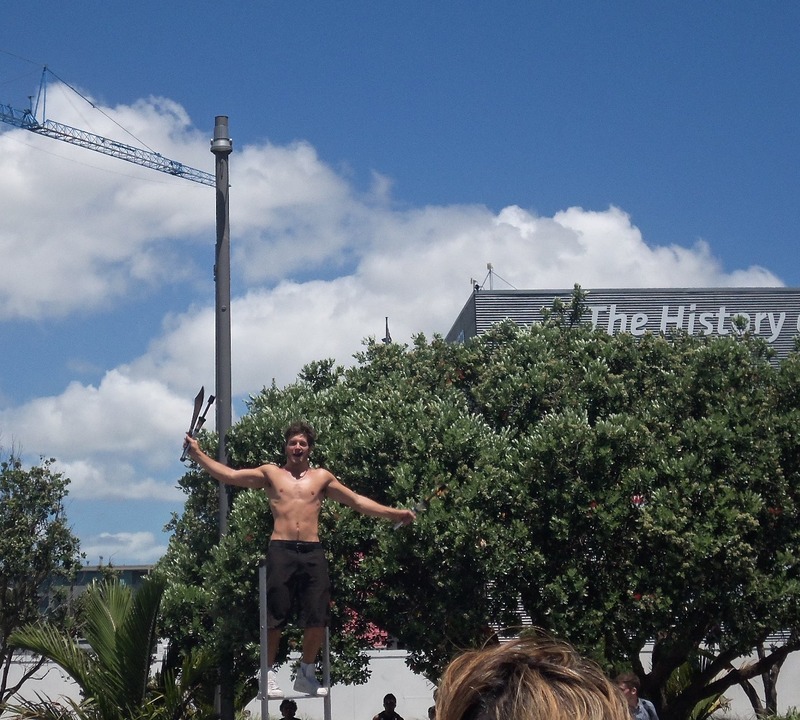 On the last couple of Sundays we have taken trips to two of the city’s cultural offerings. Auckland Art Gallery is an architecturally stunning building and has recently been awarded World Building of the year. 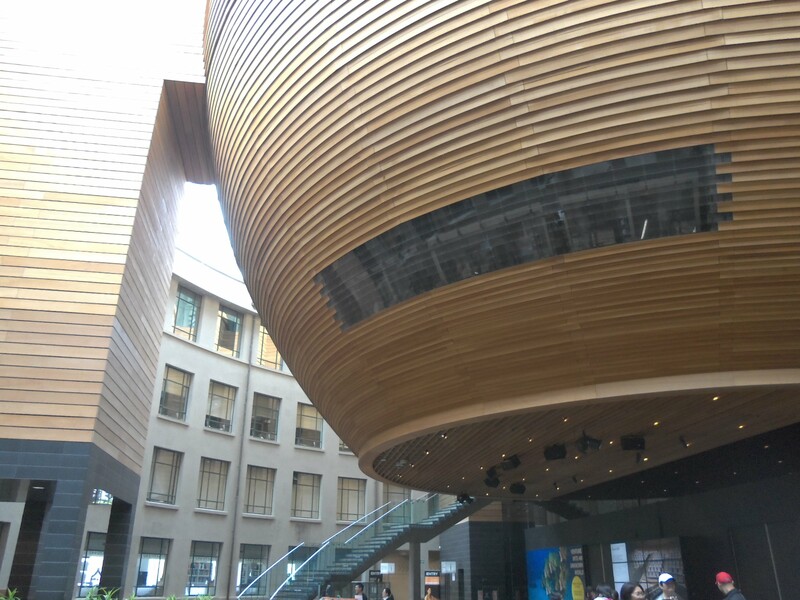 The original space was extended 2 years ago and has been redeveloped with expansive windows and wooden canopies. We headed to the gallery primarily for brunch and enjoyed the unusual but delicious Mexican dish of enchilada and pulled pork (with some of their finest English tea). After our hangover hunger was sated, we explored the galleries’ permanent exhibitions of NZ art throughout the centuries and an exhibition of one businesswoman’s vast and varied collection of contemporary art (which prompted an exchange of puzzled looks between us). After attending the recent opening of their Freedom Farmers exhibition (for Keeping Up with NZ), I took Rob for a look a better look around this new collection of native artists ‘growing ideas’. During the few hours we were at the gallery, we saw one of the Freedom Farmers artists giving a talk about their work and there was pottery followed by a drawing class on the mezzanine. 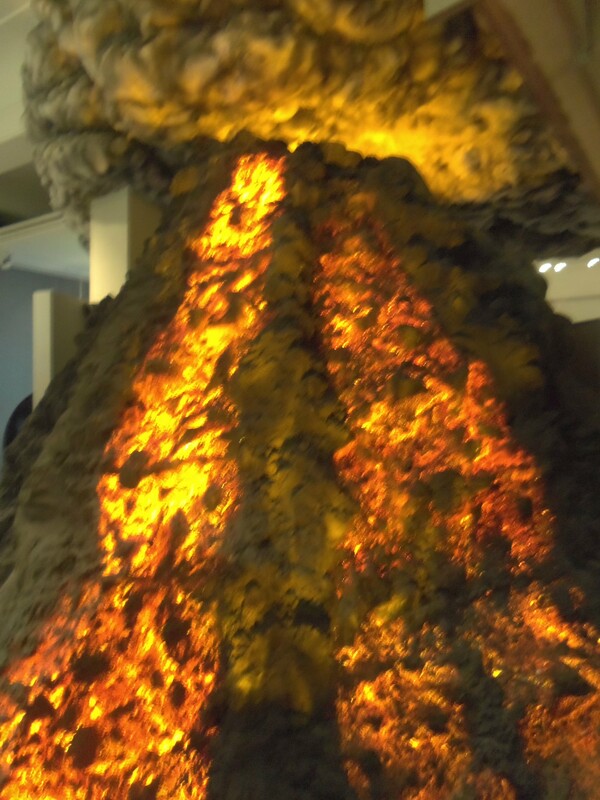 In the natural disasters gallery, we experienced a living room simulation of a volcano eruption in modern Auckland (which is a scarily high risk!) Another gallery that we both enjoyed was the ‘weird and wonderful’ room (almost definitely designed for children), offering an interactive approach to the natural world. We arrived only spent the afternoon at the museum and could have easily spent the day there. 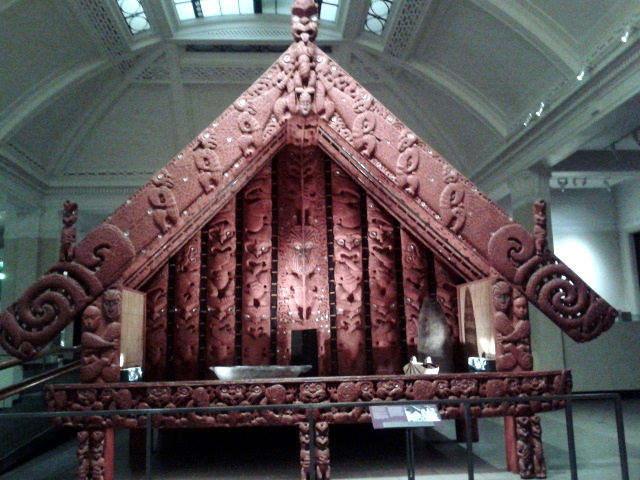 I’m also sure we’ll visit the gallery again while we’re in Auckland. Auckland Art Gallery is open daily 10am – 5pm and entry is free (with charges for special exhibitions). 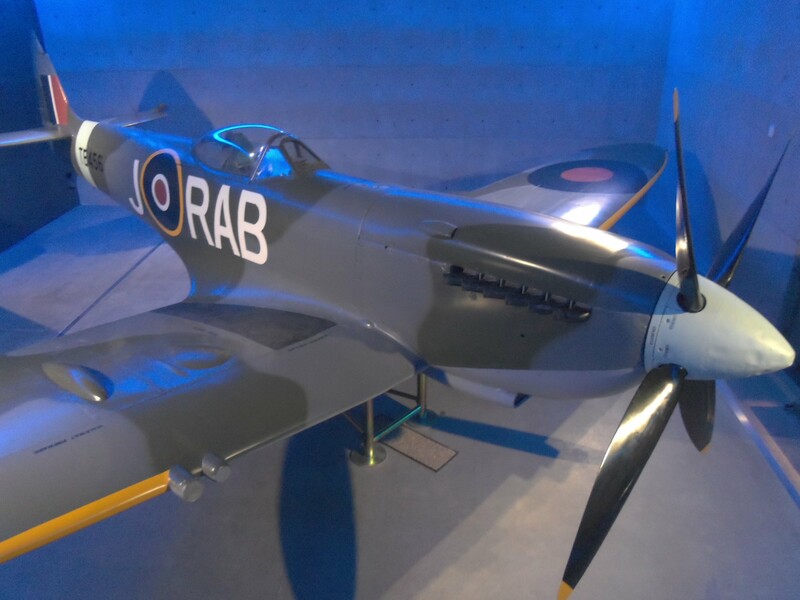 They also offer daily free tours at 11.30am and 1.30pm. 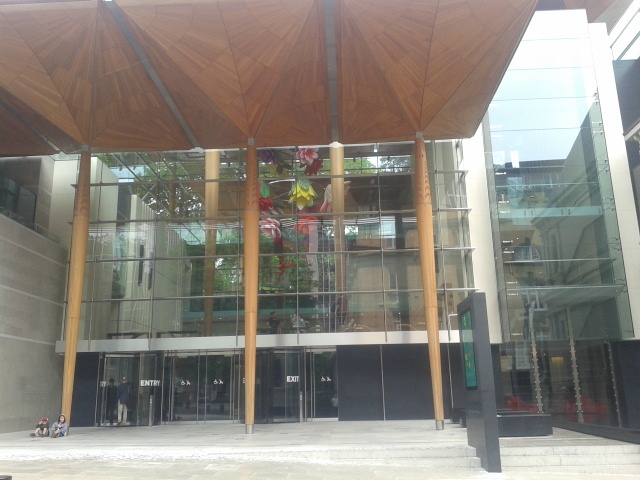 Auckland Museum is also open daily 10am – 5pm and general admission is $25 for international visitors. 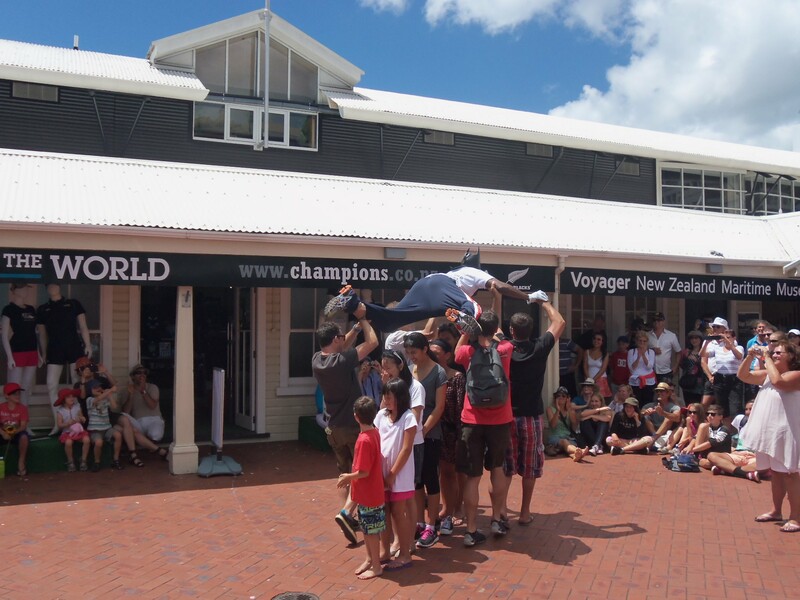 They also offer packages with tours and a Māori cultural performance. 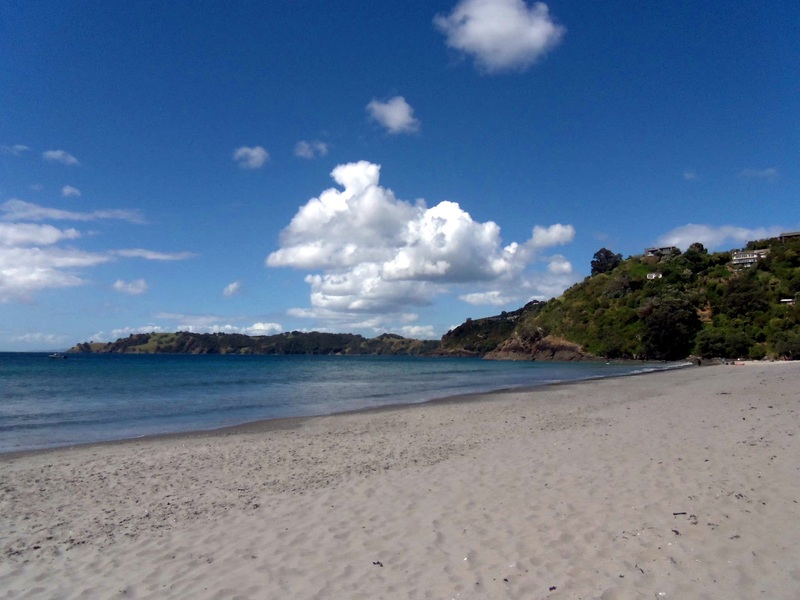 We took advantage of Monday being a bank holiday in NZ and took our first trip out of the city to Waiheke island. Somehow we managed to make the 9am ferry from Auckland and headed across the bay to experience our first slice of island beauty that NZ is famous for. 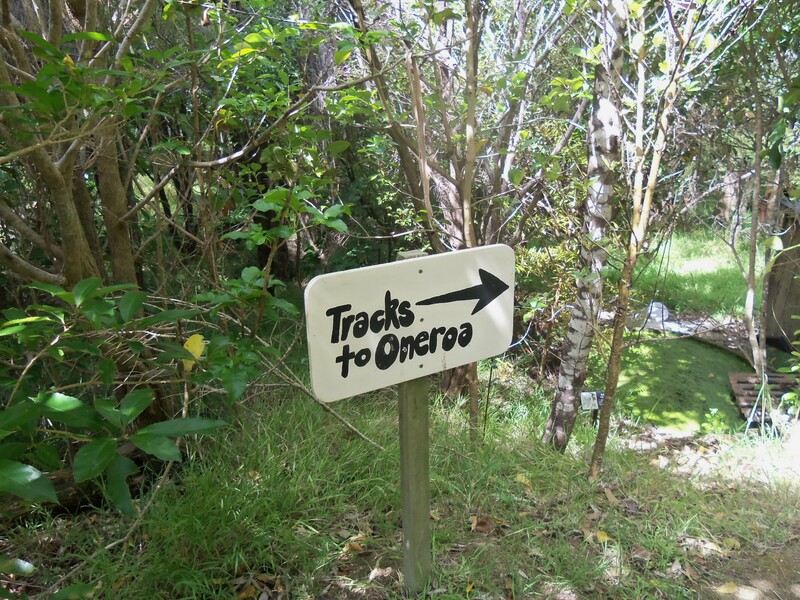 On arrival at Matiatia bay on Waiheke, we followed a scenic woodland track for 20 mins to the nearest town, Oneroa. This is a charming strip of independent shops and cafés along the beach. We had a wander around and popped into the tourist info to find the bus stop to our main stop of the day, Wild on Waiheke. After reading positive reviews of this activity centre on Tripadvisor, I booked us in for archery & clay bird shooting, followed by lunch. We were a little early, so we sat in the sun and took in the view of adults wine tasting and playing boules & giant chess and children attempting to play volleyball! We were then taken by instructor Kelly for our activities, which were such fun (!) 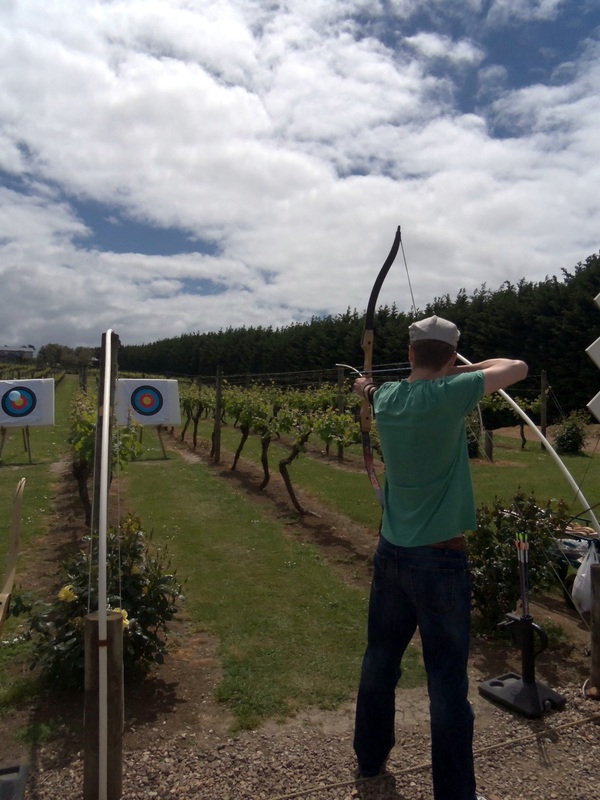 Starting with archery; we shot arrows amongst the grape vines, Rob effectively channeled his inner Robin Hood and, when aiming to pop a balloon, I managed to shoot my arrow to rest on top of it. We were shooting with another couple and we all achieved respectable scores, with the men doing particularly well. However, during the clay bird shooting, we took it back for the women! We were using real shotguns that had been fitted with lasers and shot at flying disks overhead. It was made quite tricky by the breeze and took a few rounds for any of us to score. After half an hour’s shooting the girls proved a better aim, but our scores weren’t good enough to catch up after the archery and Rob won overall with a handsome score of 155. We worked up quite an appetite and were clamming to try some of the locally produced food. 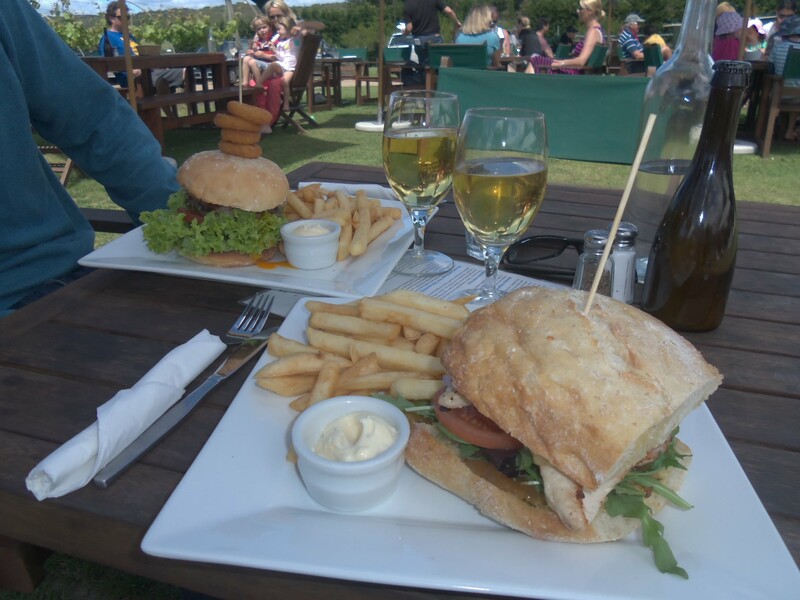 For lunch we had burgers and tried the Waiheke cider. They also had beers and wine tasting on offer, there was to much to choose from! My burger was delicious, with chicken from the grill, brie and apricot chutney. 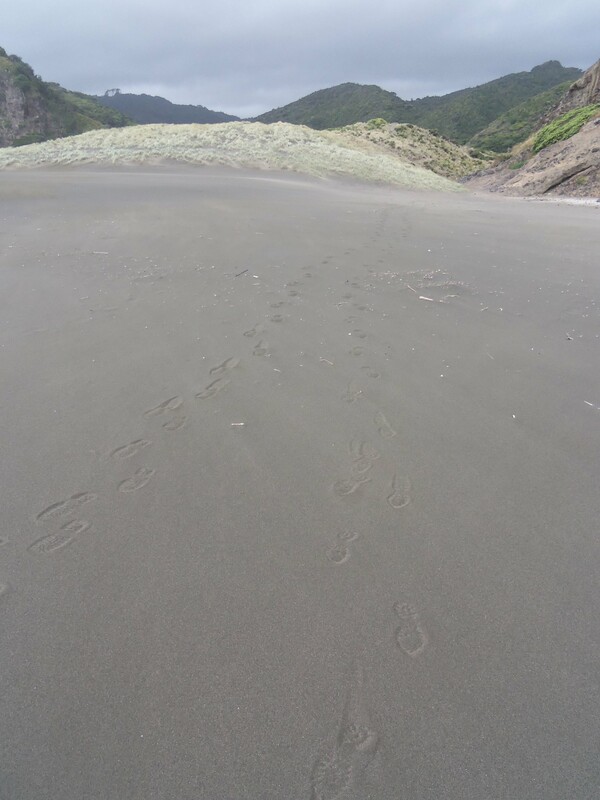 To walk it off, we to a stroll to Onetangi – the biggest beach on the island and had an afternoon doze. 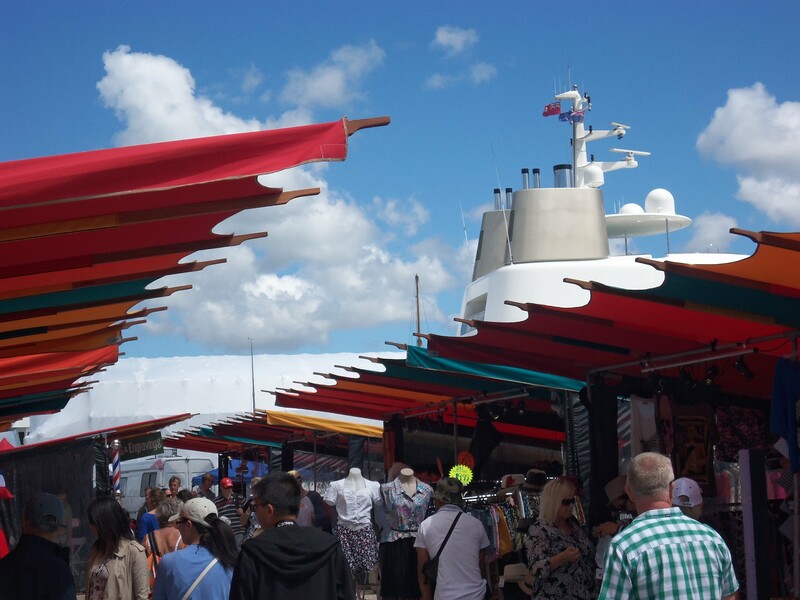 Waiheke felt to have a very strong community, of artists, surfers and those retiring to a slice of paradise. When we were planning our trip, there were so many options for activities and ways to get around the island. It is known for its vineyards, which we barely saw and you can hire a car, bike or even an electric tandem. 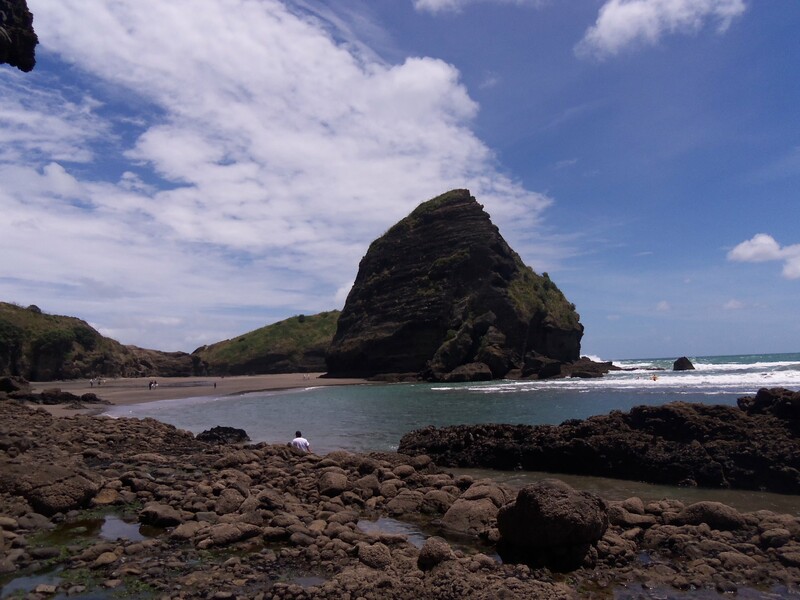 However, I agree with advice that we were given that for a first day trip, Oneroa and Onetangi are good places to start, and we enjoy exploring places on foot where possible. After an hour or so on the beach, we took the bus back to our first stop at Oneroa for a coffee with a view over the bay. 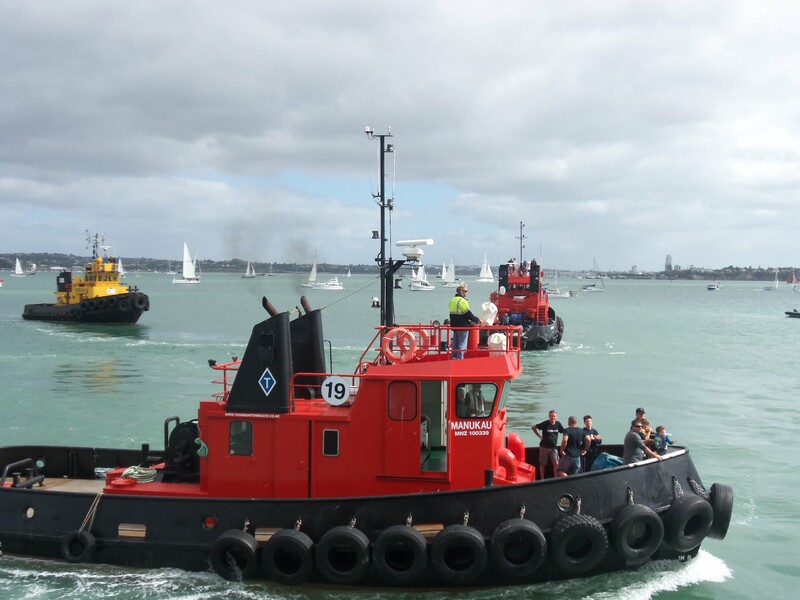 We walked back to the ferry and made the 5pm it by a whisper for a very blowy return crossing to Auckland. I left Waiheke island with sunburnt ears & hair parting and a desire to return for a weekend of wine tasting. We took a Fullers ferry, which runs on the hour, takes 45 mins and costs $35.50pp for a return ticket. 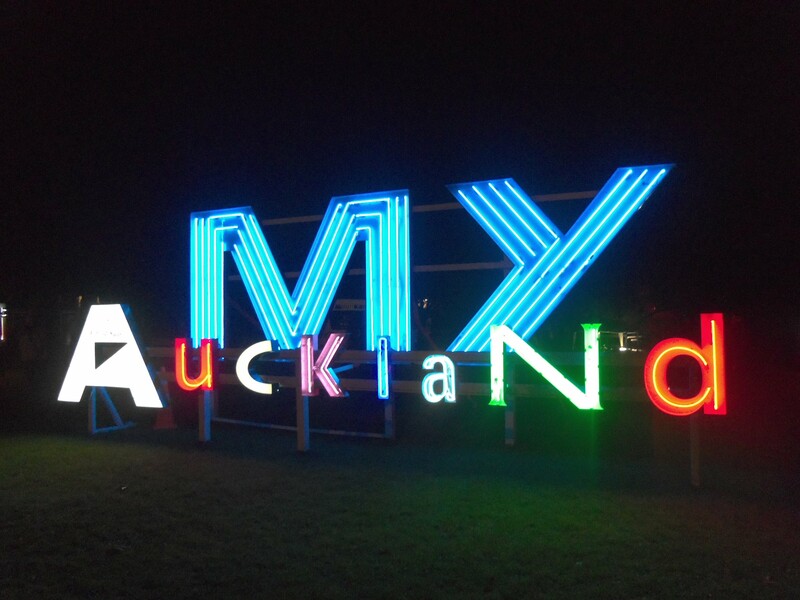 There’s a 10% off coupon in the Auckland A-Z. They also offer good looking tours on the island. Fullers also offer a day bus pass for $9, 4 routes cover much of the island but not all of the vineyards. Pick up a timetable, as they’re not very regular. 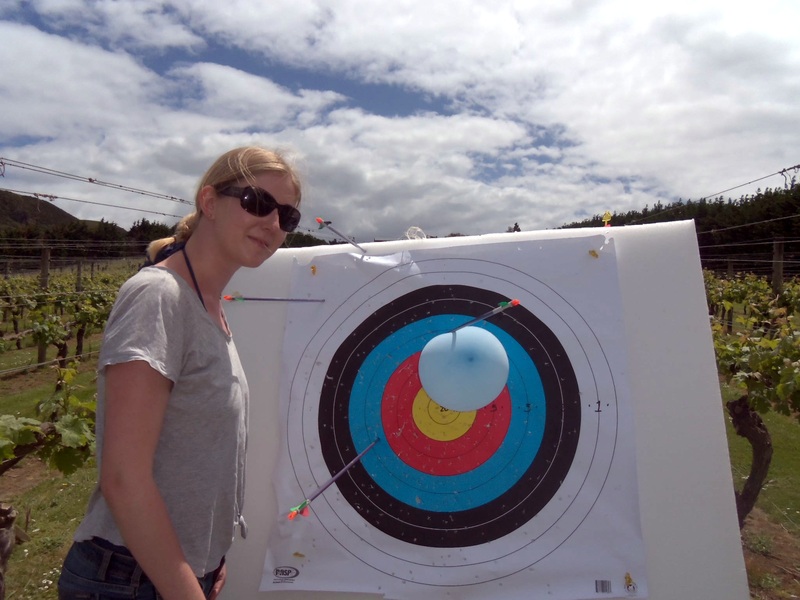 Wild On Waiheke offer archery and clay bird shooting for $25 for 30 mins or the combined hour we did cost $45. Most activities and cafés seemed to close at 4pm.